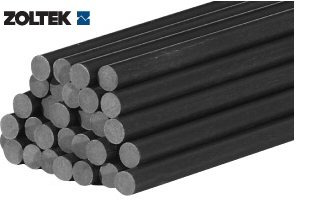 Zoltek is introducing a line of pultruded carbon fibre profiles. Automotive supplier Magna Exteriors and Interiors and carbon fibre maker Zoltek have developed a low-cost carbon fibre sheet moulding compound (SMC) for automotive applications. As new production technologies lower carbon fibre cost, the global market for carbon fibre reinforced plastic (CFRP) will more than double to $36 billion in 2020, growing at a compound annual growth rate of 13%, according to a Lux Research report. Complementing its prepreg and fabric offerings to the wind industry, Zoltek is now delivering carbon fibre laminates of constant cross-section that will serve as structural reinforcements in wind turbine blades. These pultruded profiles are manufactured by Zoltek using its Panex® 35 Continuous Tow carbon fibre. Depending on the end application, the profiles are typically produced with a thermoset epoxy or vinyl ester resin. Available in a variety of thicknesses and shapes, the pultruded parts are said to deliver optimised properties with high fibre volumes, nearly zero void content, and locked-in filament alignment. We also expect our new product offerings to speed the development of longer blades for higher megawatt wind turbines and to facilitate other breakthroughs in the use of advanced composites in other fields, such as deepsea drilling and oil production. Initially, Zoltek is targeting wind energy applications for this new product line to cater to a new trend of designing and building blades with 'pre-cured' or 'production-ready' carbon composites as the structural member. “Over the past two years, we have made substantial additions to our capacity to produce composite intermediates, including prepregs, fabrics, and pultruded parts,” says Zsolt Rumy, Zoltek’s Chairman and CEO. “Our new intermediate products are designed to simplify and significantly reduce manufacturing costs for blade-makers and other end users."